il mondo di Rory: Fashionme! Hello everyone, dear followers, I am very pleased to talk about Fashionme, a very assorted, convenient online shop offering high quality products. In this shop you will find a wide selection of items always fashionable and trendy at prices that are more than excellent. Buying in this shop is really very simple and easy, deliveries are reliable and even payments are safe, from the comfort of your home choose clothes that reflect your taste and that you like best. You will find a wide selection of jackets, long or short dresses, shoes, accessories of excellent quality, trousers, jeans and much more because the choice is wide. You will find elegant clothes suitable for important ceremonies, but also casual clothes, suitable for any occasion. I find this jacket with a very nice and special checked zip, it goes perfectly with jeans and is ideal for casual occasions and events, very original I would say. 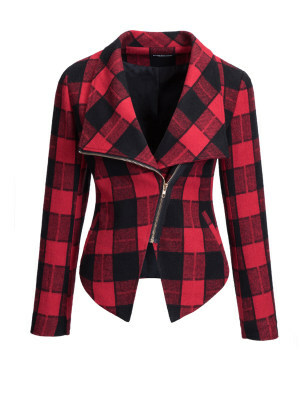 Very nice also this jacket, trendy trend, ideal for women who love to always be at the top. very nice this vintage style model, ideal for refined and classy women, with attention to detail and details, very beautiful and original. This striped model with a casual and timeless style is also very particular. I remind you that all these accessories are available in different sizes and colors, suitable to meet the needs of each customer. The fabrics used are of excellent quality, resistant. Visit their SHOP and make your purchases in full freedom spending little, you will be satisfied just like me.